If you’re looking to lessen the appearance of wrinkles and loose skin, laser skin tightening may be your best choice for several reasons. Viora and Exilis skin tightening is a great choice because it’s minimally invasive. An infrared light source heats the collagen under the skin’s surface and tightens the skin above. There is no recovery period associated with the treatment. Side effects are mild and resolve on their own within a few hours. Since the treatment is non-surgical, there are few medical risks associated with it. You’ll be pleased with skin tightening from Viora Reaction and Exilis Ultra before and after results. After a treatment, patients see visible results immediately. Skin will feel and look tighter and smoother because the process works on the collagen underneath your skin, and you can use it anywhere on your body. Your face, neck, abdomen, arms, legs, and buttocks all will show firmer looking skin after one treatment. Many patients opt for laser skin tightening rather than liposuction or a mini tummy tuck. For the most dramatic Viora Reaction and Exilis Ultra before and after, you should purchase a package of four treatments about a week apart. Some centers even offer additional acoustic shockwave therapy to enhance the results and encourage collagen generation. Skin Tightening treatments are often a permanent solution. The treatment prompts new collagen growth, and the areas treated start to look tighter and younger from the presence of new collagen your body is making. Since the treatment activates your collagen’s regenerative capabilities, the effects continue to improve over the months following the treatment. Your Viora Reaction and Exilis Ultra before and after pictures will show the results from increased collagen activity continuing for months after the treatment. Viora reaction skin tightening and Exilis ULtra are FDA approved to reduce the appearance of fine lines, wrinkles and skin laxity. Each treatment session takes as little as thirty minutes or as long as an hour. Patients are able to return to work and normal activities immediately following treatment. Some people experience minor side effects like skin sensitivity, redness, or minor swelling but these side effects usually resolve themselves in a few hours. 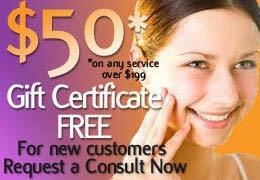 .A traditional facelift can set you back $8000 to $15000 depending on the the amount of work you want done. Add recovery time where you can’t work or play, and the facelift can be a costly and unnecessary luxury for most people. Skin tightening treatments can cost anywhere from $500 to $3500 depending on the size of the area and how many areas, and there is no recovery time. And it is so easy that you can get your skin tightening treatments during your lunch break. Anybody can see results with viora reaction and Exilis skin tightening . It works for men and women. You’ll see the best results if you are between the ages of thirty and sixty.